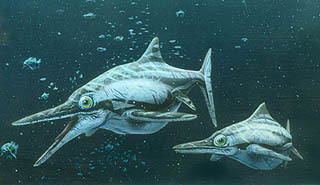 Ichthyosaurs resemble a cross between a reptile and a bottle-nose dolphin. The name ICHTHYOSAUR literally means "fish lizard". They were strange aquatic predators that appeared at the Early Jurassic Period. Sizes varied amongst different species which attained lengths from 3 to 50 feet. Like dolphins, they had lungs and breathed air requiring their periodic return to the surface. They also had long snouts lined with sharp, pointed teeth. One obvious and unique feature though, is the enormous eyes they had. It is theorized they spent much of their time diving to dark ocean depths and needed a large, light-gathering eye to see. Ichthyosaurs were very swift and powerful swimmers that preyed on fish and cephalopods. They gave birth to their young live, spending their entire life in the ancient seas.